Roger Naples and fellow Gallery Gods cheered for the Bruins from the second balcony of the old Boston Garden in 1995. Roger Naples made his final visit to TD Garden in April 2015, when he participated in presenting the Eddie Shore Award to Bruins winger Milan Lucic. The Shore award for “exceptional hustle and determination” was established by the team’s most loyal fans, the Gallery Gods, whose original domain was the second balcony of the original Boston Garden. Naples — who went by a shortened version of his last name, Napolitano — helped found the Gallery Gods in 1937, when he and his friends sat in the Garden watching Shore, a Hall of Fame defenseman. And 78 seasons later, he closed out his decades at the Bruins’ home rink by standing in a corner of the ice with three generations of Shore’s family. A lifelong Revere resident who served as the city’s recreation director for more than 40 years, Mr. Napolitano died of congestive heart failure Oct. 13 in Massachusetts General Hospital. The longtime Gallery Gods president was 97. The Bruins showed appreciation for Mr. Napolitano by making him an honorary coach at the team’s alumni games, and giving him an autographed No. 73 jersey to commemorate the number of years he held a season ticket. The legendary Bobby Orr donated autographed photos when Mr. Napolitano held fund-raising events. Orr, according to Mr. Napolitano’s family and friends, was invited to the Napolitano home for dinner his rookie season and the friendship between the two men grew. When Mr. Napolitano visited the team’s training camp in London, Ontario, in the 1960s and ’70s, he brought along friends and family, including his niece Elaine Stilwell of Melrose. She met her future husband, Bill, at a hockey game at Boston Garden, which she attended with Mr. Napolitano. Bill Stilwell, who joined the Gallery Gods, noted that the group even went to games played by the Bruins’ American Hockey League affiliate, the Boston Braves, in the early 1970s. “You couldn’t walk very long with Roger in Revere before someone would come over and say, ‘You took me to my first hockey game,’ ” said Mr. Napolitano’s niece Janice Wildman of Revere. In 1982, WCVB-TV featured Mr. Napolitano in a segment by Channel 5 sportscaster Clark Booth. 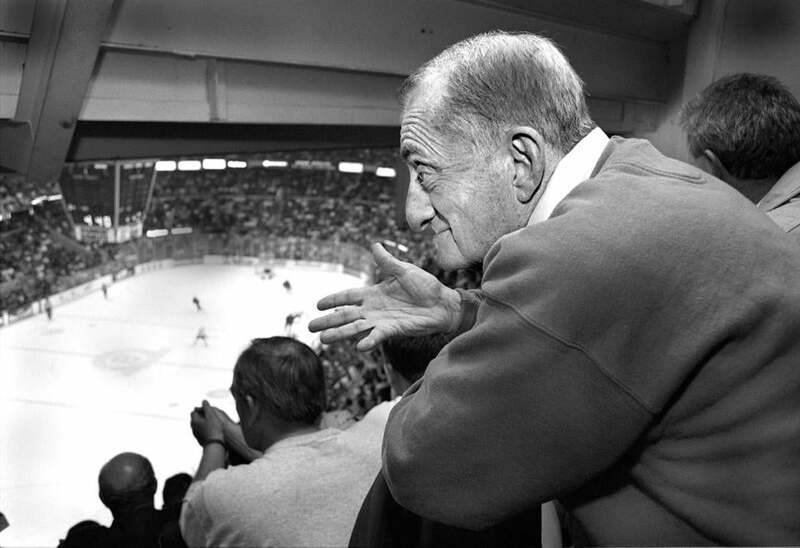 Mr. Napolitano was “a man of the people who was proud of that identity and proud of his association with the Bruins,” Booth said in an interview. The Gallery Gods once numbered about 1,000 members. Now, fewer than 100 sit throughout the TD Garden. The exodus began when corporate boxes replaced their original seats, but Mr. Napolitano faithfully kept a membership list until he died. In response, Mr. Napolitano and his friends boycotted the following game. Bruins general manager Art Ross then met with two Gallery Gods representatives in his office and decided the group could occupy the first two rows of 16 sections, eight on each side, in the second balcony. “They let us reserve the seats and charged us 15 cents more to do it,” said Mr. Napolitano. As a section leader, he collected the money and bought the tickets, each of which cost 55 cents, once the extra 15 cents per seat was added. He graduated from Revere High School in 1938 and drank champagne out of the Stanley Cup a year later at the invitation of Bruins forward Ray Getliffe. Mr. Napolitano’s presentation of various awards on behalf of the Gallery Gods dates back to that era. In 1942, just before the regular season’s final game, he was part of a committee of four who presented wristwatches to goalie Frank Brimsek and defenseman Johnny Crawford. The Gallery Gods deemed those two the team’s most valuable players that season, and they also gave Art Ross a ring after the game. A son of Pasquale Napolitano and the former Margaret Ruggiero, Mr. Napolitano was an Army veteran of World War II. As recreation director in Revere, he was instrumental in starting a popular men’s softball league in the 1950s. He also played in the league, which flourished for many years. His fund-raising softball All-Star games sometimes featured his Bruins friends, including Orr, Sanderson, Brad Park, and Ace Bailey. Mr. Napolitano, who never married, was public address announcer at Revere High School football games for 25 years and had been a close friend of the team’s late head coach Silvio Cella. Mr. Napolitano also was a commentator on Revere cable television and a supporter of the Row Row Row to Revere event to raise money for spina bifida research. A funeral Mass for Mr. Napolitano will be said at 10 a.m. Tuesday in St. Anthony Church in Revere. Burial will be in Holy Cross Cemetery in Malden. “When I visited Roger in the hospital just a few days before he died, one of the first things he asked me was the score of the Bruins game,” said his close friend Henry Higgins of Swampscott, who succeeds him as Gallery Gods president and had driven him to TD Garden in 2015, when Mr. Napolitano helped present the Shore award. In 1998, when the vacant Boston Garden was being demolished, Mr. Napolitano was wistful about the decades he had spent in the building.